Everything from Self Improvement, to Hacking, To ferrets and pretty much anything in between. Encryption and android, putting on your digital armor. How much personal information do you keep on your mobile device? Your phone, or tablet, the devices that follow you everywhere you go, chances are you probably keep a whole lot more than you think you do. If you lost your phone, I bet it likely you’d feel naked, exposed and vulnerable. All your contacts, search history, GPS history, email, and a wealth of personal and private information would be available to anyone who happened to come across it. Most people only use the slide to unlock that leaves all your data open for any person with nefarious, dastardly intentions to steal or use against you. Tonight I’m going to discuss one option that android offers to help protect you from just that scenario. Since the release of Honeycomb, it has been possible to fully encrypt your device. Once you choose to encrypt your device, you cannot undo it without a factory reset, meaning to remove the encryption, you will have to destroy all the data on your mobile device, so please, proceed with caution. If like to take a moment to discuss encryption, and what it actually does, because many people are lead to a false sense of security thinking since their device is encrypted that their data is completely protected, and unreadable to anyone else. This is a false statement, and there is no such thing as a security silver bullet. There will ALWAYS be a way around your security, but leaving your door open just screams “rob me blind, I don’t even shut my door”. Digital security is often the same. If you leave your phone laying unattended with no protection, even a person who means no harm might be tempted to look at its contents. An encrypted phone or tablet, will lock your data with a PIN or password. Without the password, the data on the device looks like garbage. It looks like garbage that is, when it’s locked. While you’re using it, your data is readable. So if you leave a delay timer to prevent the phone from locking, you are leaving the door open for a small amount of time. 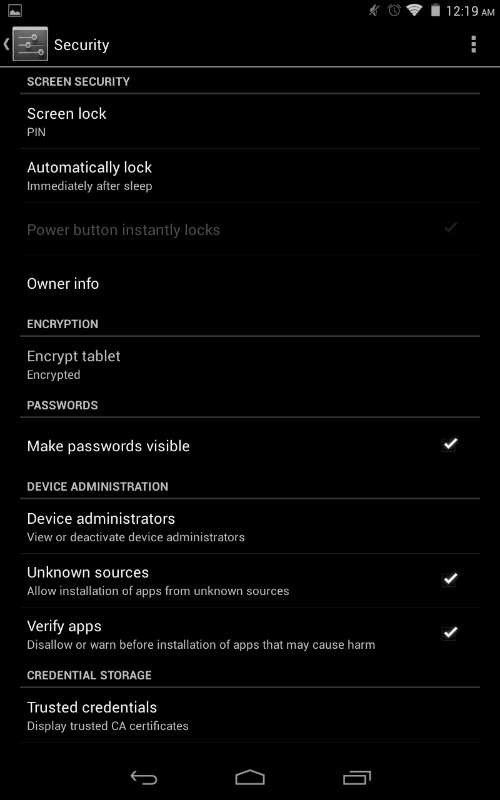 I suggest setting the power button to automatically lock, and also to avoid any delay in screen lock after the screen powers off. This will help to ensure that while you are not using your device, nobody else is either. If encryption sounds like something you are interested in, I will be more than happy to wall you through the setup. Once you have taken the previous two steps, click on the “encryption” section and click the button to start the encryption process. The encryption took almost a full hour on my nexus 7, so I would expect at least that, unless you only have a very small amount of internal storage. Once you have encrypted your device, you will need your PIN or password for the following situations; powering on, rebooting, or waking the device from sleep, booting into recovery. To be honest, you will type it so often, it becomes second nature to you. I encrypted my tablet a few weeks ago, and I have not noticed any performance difference, or had any negative experiences due to the device being encrypted. 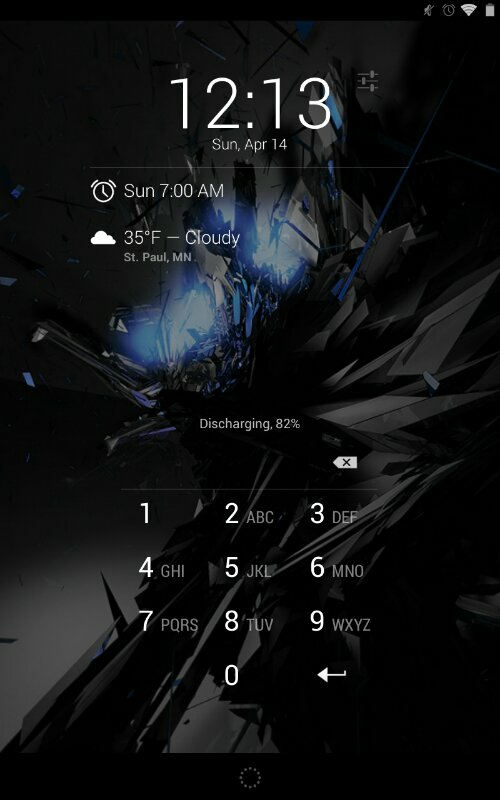 You can still use lock screen widgets, I use my tablet for alarms, and you don’t need to type a password to silence or shut off the alarm, only to gain access to the device. There is a project I’m working on, and I need to keep all my data secret, and confidential. What can I do if I’m still wanting to save my data on a removable USB-key? Have you ever asked that question? I have been asked something along those lines more times than I can count. In reality, there are a few different options.